Play area renovation - from old steel equipment to new timber equipment. 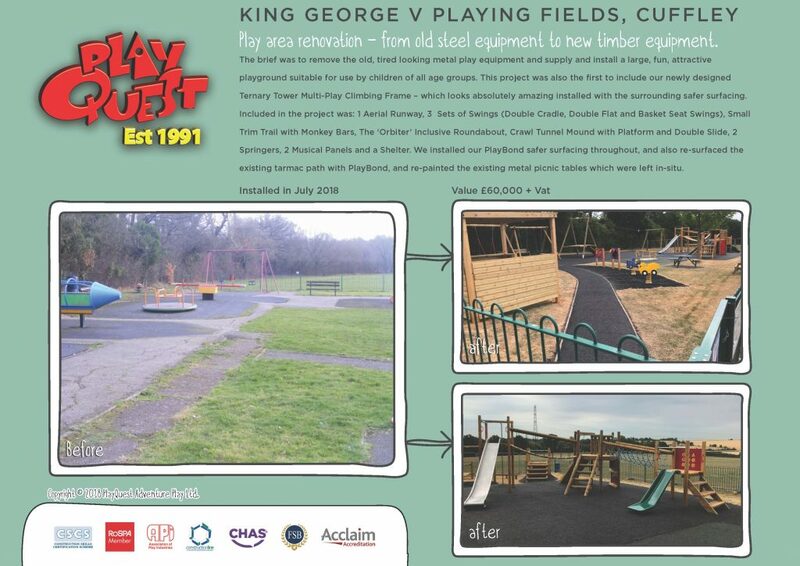 The brief was to remove the old, tired looking metal play equipment and supply and install a large, fun, attractive playground suitable for use by children of all age groups. This project was also the first to include our newly designed Ternary Tower Multi-Play Climbing Frame – which looks absolutely amazing installed with the surrounding safer surfacing. Included in the project was: 1 Aerial Runway, 3 Sets of Swings (Double Cradle, Double Flat and Basket Seat Swings), Small Trim Trail with Monkey Bars, The ‘Orbiter’ Inclusive Roundabout, Crawl Tunnel Mound with Platform and Double Slide, 2 Springers, 2 Musical Panels and a Shelter. We installed our PlayBond safer surfacing throughout, and also re-surfaced the existing tarmac path with PlayBond, and re-painted the existing metal picnic tables which were left in-situ.